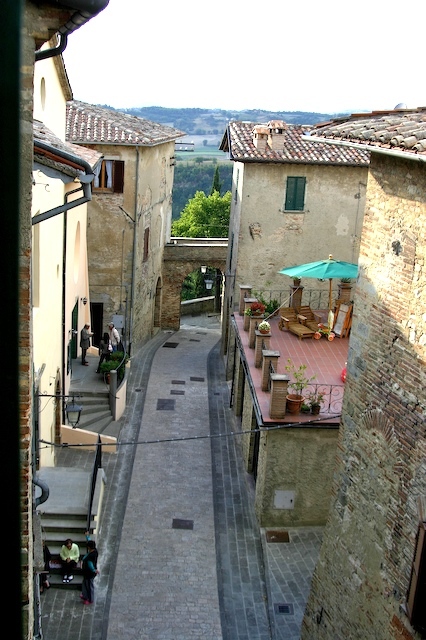 For all of our friends who follow the doings in Montone….we are freezing! Two afternoons ago, a fierce wind blew in a storm front and within 10 or 15 minutes, we had a huge temperature drop. There has been hail storms, and SNOW on some of the surrounding hills. Carla Benzina (she runs the little gas station in town, and no, her last name in not really Benizina) all of her flowers have died because of the frost. We thought we were about to have a tornado last night! High winds, rain, tree branches down everywhere. We’ve had to bring in all of our potted plants at the restaurant. I’m really worried about the grape harvest as this comes at a critical time and could be a disaster for the local vintners. First Piemonte gets pounded with rain, and now we get this incredible cold snap. Very crazy weather! Really strange weather…it’s still cold. I hate it when we have to close the windows because then we can’t hear the bells ring, and then I have no idea what time it is! OK, I’ll post some photos of our house (and our kitties).